It is 100% typographic; there are no images used at all. It includes the PSD in case you want to make modifications and want to feel it out graphically first. You can do whatever the heck you want with it. No attribution required. 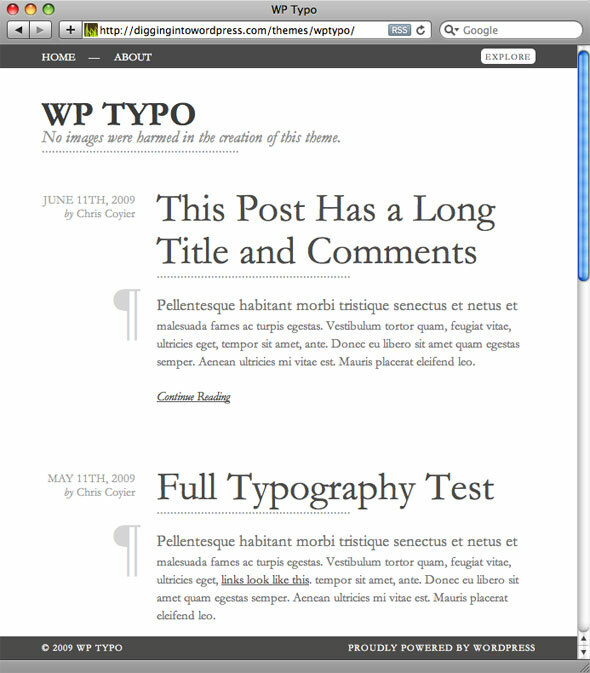 Here are some screenshots of the theme in action..
Garamond! Lovely. Serifs seem to be making a comeback. Nice one, Chris, like the subtle touches, love the absence of colour, images etc. It seems that those features are often used to hide lack of design skills these days … Thanks ! Nice, particularly like the comments form. Good job. Love it, need to use it! A really nice simple design, you can’t beat a typographic design – great work. I must say, using that review for the good of the community (and not your own personal gain) shows a lot of integrity. Chris, looks fantastic, but won’t it be completely ruined without the Garamond font which isn’t a standard font? That’s fair enough, but from a designer’s point of view Georgia and Times are a million miles from Garamond (especially italic), don’t won’t to be too picky it’s just when a design relies heavily on typography a different font really changes the feel. I absolutely agree, but what are you gonna do? Fonts on the web are just tough that way. Fortunately in this theme, if Garamond fails, it fails pretty much at the top and cascades down, so at least everything with match with whatever the fallback is. cant we user @font-face for css3 enabled people? You could if you could find a Garamond-like font that was legal to use in that way. I’ve also created a cufon patch to solve this problem – you can find it here1. So at least h1, h2 & h3 titles and classes .description, .continue, .para and .byline are now replaced by Cufonized version of jGaramond (it is not definitely nicest one, but it is free). 1 Editor’s note: 404 link removed. Thanks Mijk! I’m sure folks will find this useful. The theme looks great Chris, well done! How beautiful and elegant. A real pleasure to the eye. Beautiful! Visually stunning. I’m definitely going to take a look at all its internals. this is great. 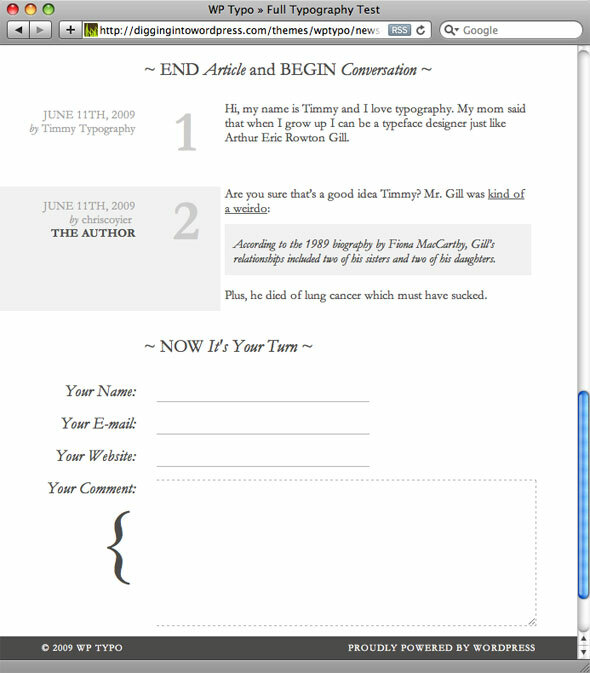 very simple wordpress themese work great, I’m not sure about using gramond, though, I might have to tweak it a bit. Horribly nice. Just a thought – how about adding Palatino and “Palatino Linotype” to the font stack? Also, why aren’t you using the official WordPress theme directory? I don’t know squat about licensing, and apparently they need some kind of license attached to them. It needs to be widget compatible which this theme isn’t. It needs to use gravatars which this theme doesn’t. Actually, those things aren’t that hard to implement. I think they just use GNU, so you just drop that into your readme. But it looks like because of the “explore” feature, you wouldn’t be able to make it widget compatible. But I really like that explore button, very different. Actually turns out Gravatars is the deal-breaker. You literally can’t even upload the them if it doesn’t have gravatar code in there. I have built for my purpose patch to widgetize the theme, you can find it here1. hope it will help you update the theme if needed. but it needs little more css tweaking (for example tag cloud). If he poops you all will say “wow! fantastic”. Its the fallacy of being famous. I don’t see anything beautiful in this theme. Only the comment area is bit exceptional, mainly the comment textarea. Otherwise it looks he just shot a theme with less effort and you all are jumping in joy – “bravo!! bravo!!”. Wow, why you hating man? Relax if you don’t like it .. don’t leave a comment full of hate .. i mean c’mon ! You might want to sit back and take in some of life without reacting to it. The theme certainly doesn’t work in many applications, but it’s fantastic in others. It’s simple, and easy to read (which is something many websites can’t say). This was just awesome! It’s always great to see a theme without graphics! Simple and elegant theme is always attractive. Very nice stuff. I downloaded it and am using it on my (sad-to-say rarely-updated) blog. I had some fun modifying the CSS to suit myself. I even had to go into the PHP a little, since your theme doesn’t allow for having categories, but it was pretty easy. Thanks for the inspiration. Hello. Nice theme. Beautiful. I feel like reading a newspaper with no picture, but more white space to breath. But I think you should post at least one with pictures. I’m just curious how it would be placed or decorated. This theme is awesome, thou I have found 1 minor bug (so far), it relies on native OS background and my (Linux) background isn’t white. I thought you would want the report, maybe you will get some refund on that :) Cheers! This code was here to remove original WP jquery and replace it with newer. If you remove this code, Wysiwig editor in 2.8 works well, but the theme is broken (menu is always visible or explore button doesn’t work at all). I’m not sure why that function would affect the backend of WordPress? Just to be sure, I removed it (WP 2.8 will still load jQuery 1.3.2 that ships with it). The demo and download have been updated. The reason I did it to begin with was a) it’s faster and saves bandwidth for both the demo and for people using it and b) the native WordPress version is automatically in noConflict mode which is annoying to me. I’ve been having trouble too. Glad it wasn’t just me. That looks like the perfect solution to me Roger, I’ll put that in when I update this again. Someone also pointed out there is a plugin… but I guess it’s nicer to have directly in the theme. but you’re so much cooler with the explore effect button and i only use Georgia and serif considering there’s not enough room of innovation without the use of sifr or cuffon. btw i dont see any rss link? is it intentionally? This is a nice theme, but when I have tried it the drop down menu section at the top remains open when you load a new page. Beautiful… I totally replaced the old theme on my blog. I look forward to making some mods. Awesome design! very well constructed! Nicely done! I love how designers/developers push the limits on what you can do on the web. This is a very nice theme. We’ll done and thanks for sharing it. Hell Yeaaaaaah… I love it. Thanks Chris! I purely love the theme – amazing design, cool features and the typo lightness is sending it to one of first steps in my theme chart! Thanks, this is awesome contribution to the community! I absolutely love it… just, Super Sweet! I’d change one thing, the descenders in the comment-number (3,4,5,7,9) drops out of it’s span, so it cuts a few pixels off. This added will bump them up a few pixels by giving them a set line-height, but I think it looks better. Just wanted to tell you that the slide down “explore” fails when you click it multiple times, quickly. When I tried it in Chrome, FF and IE it got stuck every time. Very well done, except for the page navigation (older-newer post part) that looks a bit off track from the left alignment. Is it on purpose? Why? 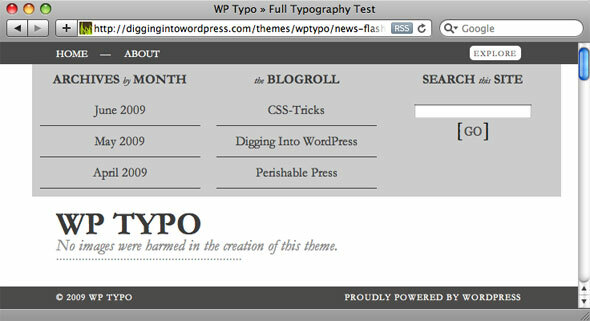 I just beginning to understand WP, I love this theme, I will give it a try. Thanks. I’m having a heart attack. I have used this great theme to make my own, thank you so much for this theme. Hey come to my blog and see my modifications. yo. what is the license on this. Can I offer it on my site witch offers free blogs. Feel free, but please mention us as the source and link to our demo and download rather than hosting it yourself. you are very nice. anything’s tutorial in wordpess . if you can see another language (eg.chinese) , it’s fantastic.